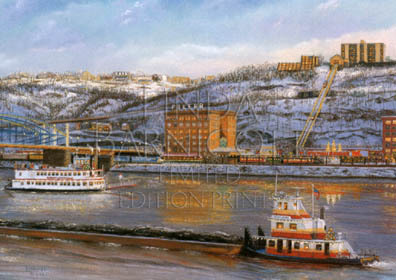 Featured on the 2000 American Cancer Society Christmas cards, “A Grand View Of Pittsburgh”. “Holiday Greetings from My Hometown” is the fourth annual holiday painting created for Breathe Pennsylvania (formerly known at Healthy Lungs Pennsylvania). A portion of the proceeds from sales will go directly to the care and medications for families this great organization supports. 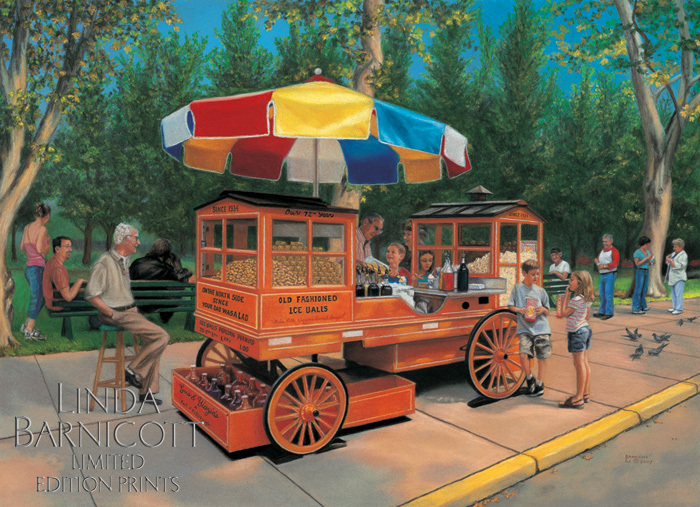 Linda’s classic painting, “My Hometown”, now available as an archival giclée print, was featured on the American Cancer Society’s 2008 holiday greeting cards. 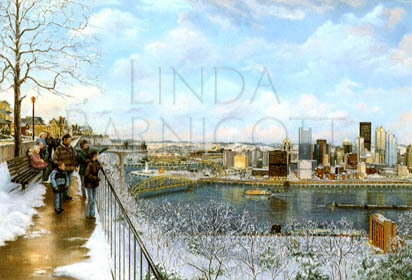 Enjoy a spectacular view of Pittsburgh from the hills of the West End in Linda’s print, “Pittsburgh’s New Horizon”. This majestic painting was featured on the American Cancer Society’s 2005 holiday greeting cards. 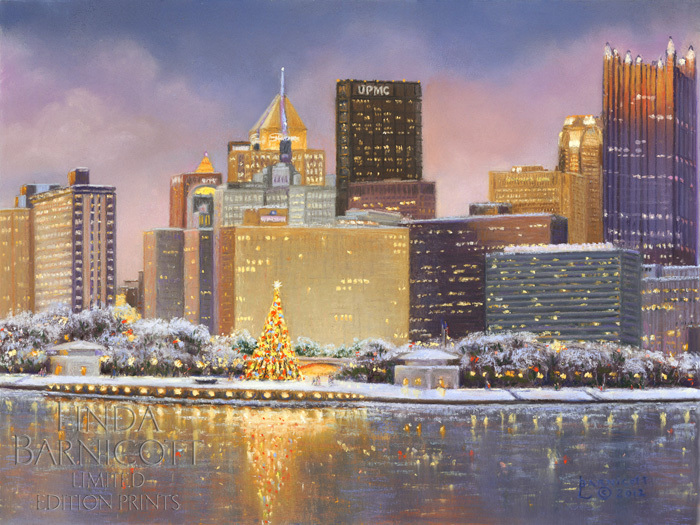 Linda’s painting, “Pittsburgh’s Shimmering Season”, celebrates the holiday season in Pittsburgh when the city is aglow with shimmering lights – especially the beautiful tree at the Point. 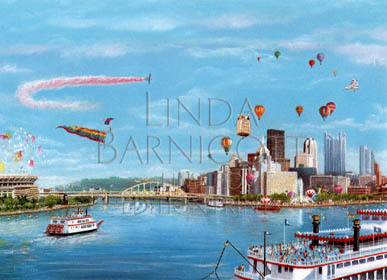 By popular demand Linda has recently released an encore edition of “Ya Gotta Regatta”. 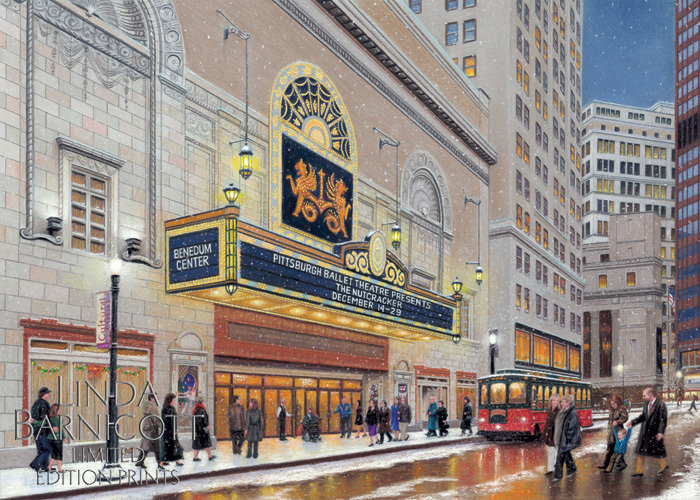 For the 10th consecutive year, Linda painted a beautiful image for the American Cancer Society’s holiday greeting cards entitled “A Snowy Evening at the Benedum”. 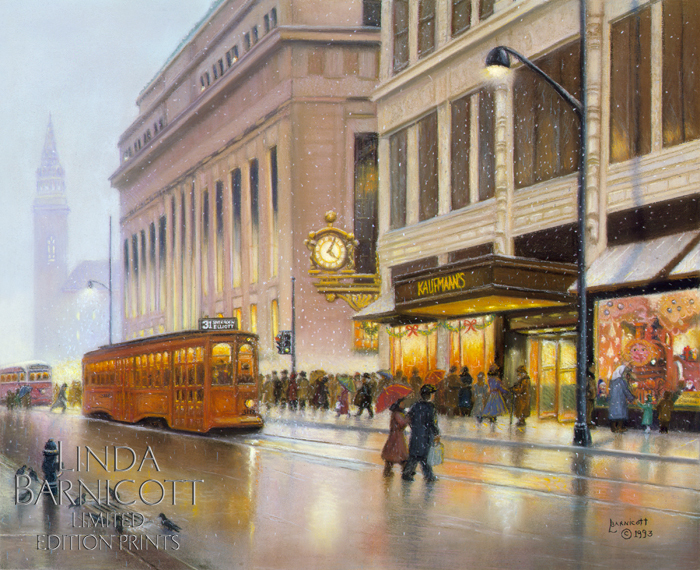 Pittsburgh has always loved the tradition of meeting under the clock and Linda’s painting, “Celebrating Time and Tradition at Macy’s”, relives the warm memories shared by Pittsburghers since 1913. 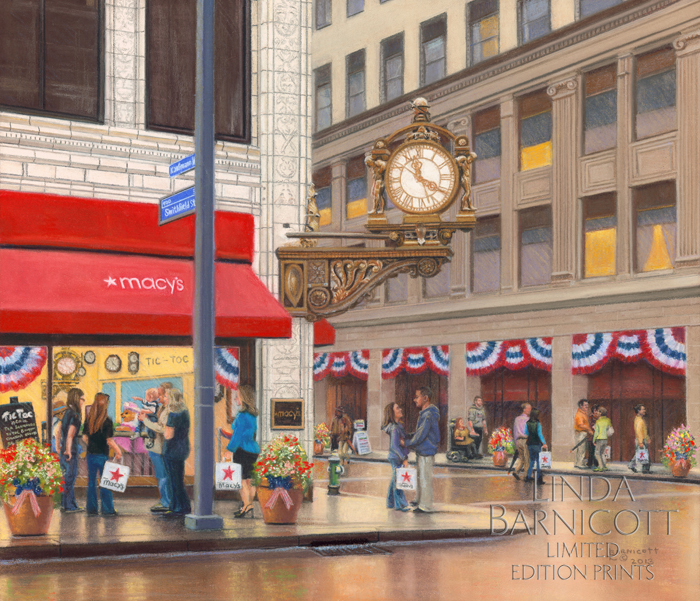 This special giclée print was created for the clock’s 100th year celebration. 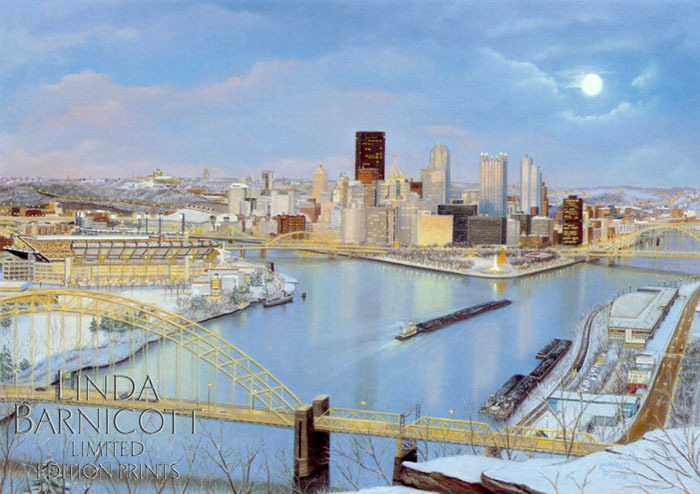 Linda was honored to be selected to paint the official painting of Pittsburgh’s Light Up Night’s 50th Anniversary in 2010. 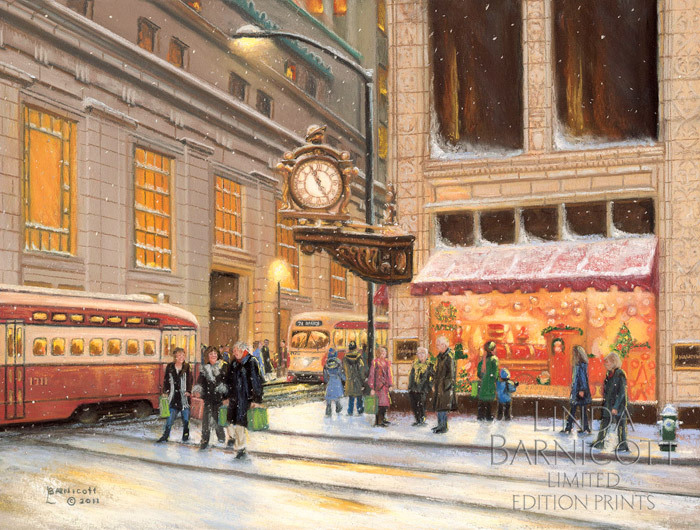 “Holiday Memories Under Kaufmann’s Clock” is the first annual holiday painting created for Healthy Lungs PA. A portion of the proceeds from sales will go directly to the care and medications for families this great organization supports. 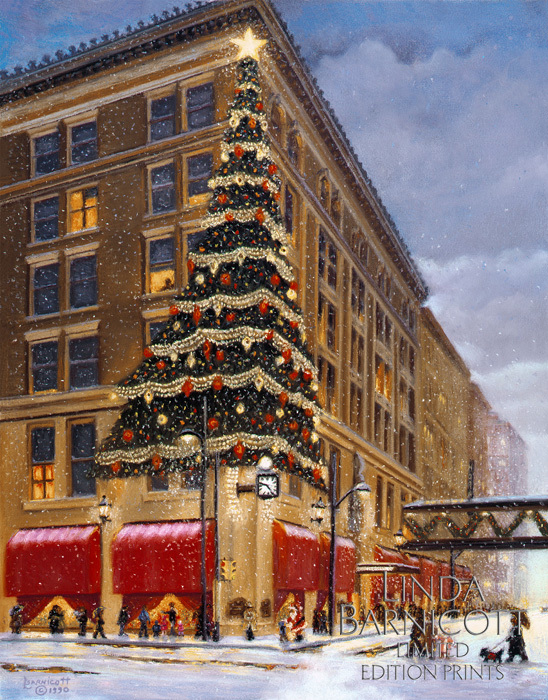 Revisit a mystical, magical time in the wintry life of Pittsburgh as spectators marvel at the holiday displays in Kaufmann’s department store.Bring this experience into your home. Capture a time when families would gather to await the arrival of loved ones and enjoy Downtown, Pittsburgh’s holiday festivities. 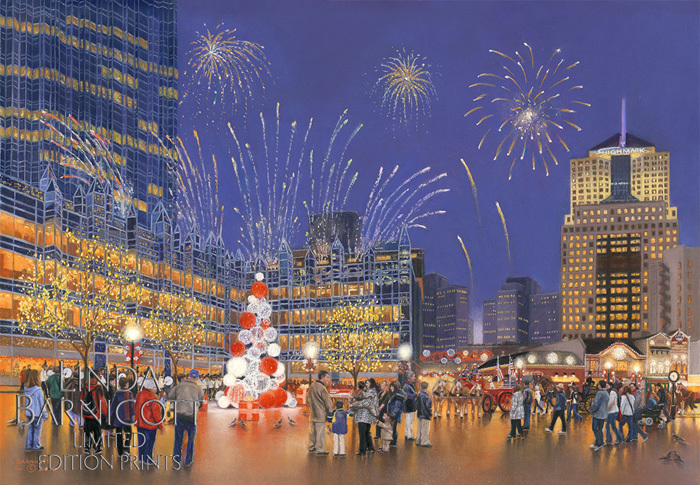 This heartwarming painting was featured on the American Cancer Society’s 2004 holiday greeting cards. 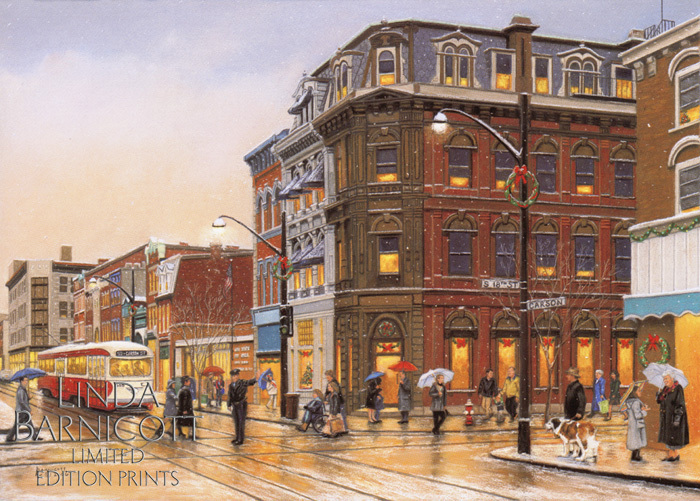 Fourth in the series, American Cancer Society Holiday Prints, “Holiday Season on Grant Street”. 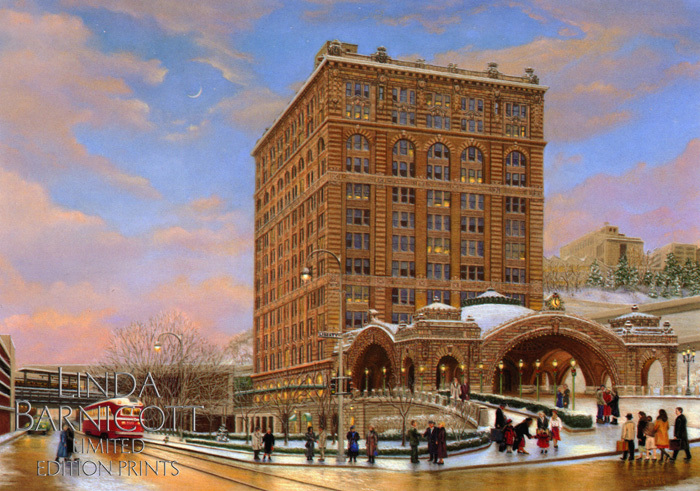 Enjoy the quaint and timeless charm of Pittsburgh’s Market Square during the holiday season with Linda’s painting, “Sharing the Season at Market Square”. 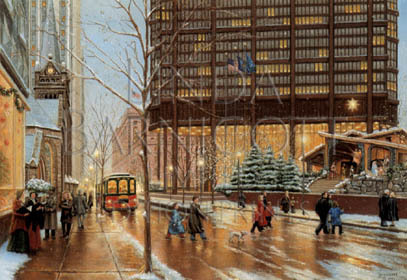 This classic painting was featured on the American Cancer Society’s 2013 holiday greeting card. Number Six! 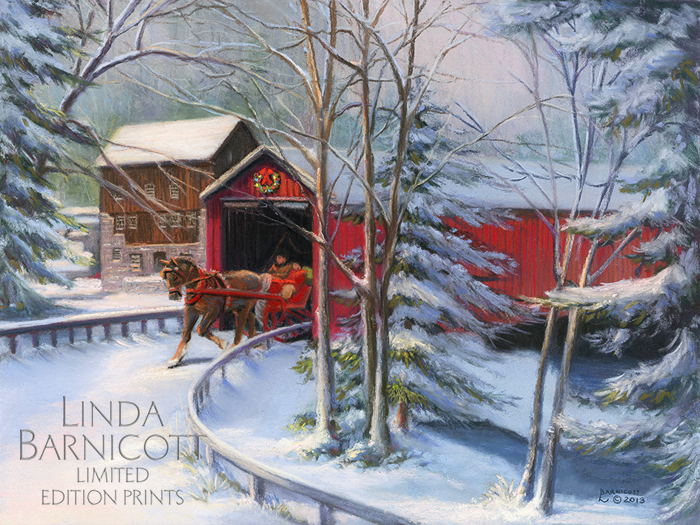 The American Cancer Society chose Linda to create an image for their holiday greeting cards again in 2003. 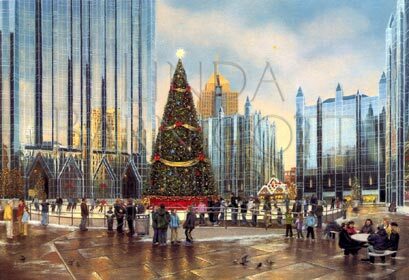 Her limited edition print, “Skating Together at PPG Place”. 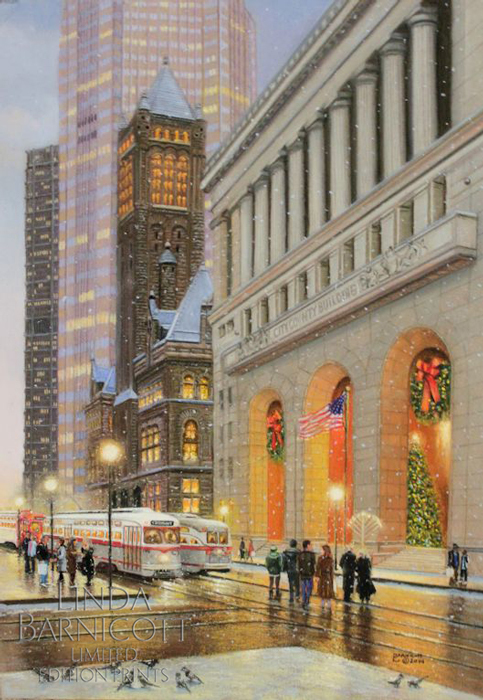 In Linda’s new painting “Winter’s Glow on Grant Street” you can almost feel the winter chill in the air as holiday shoppers cross the street to get a closer look at the wonderful tree in front of the City-County building. 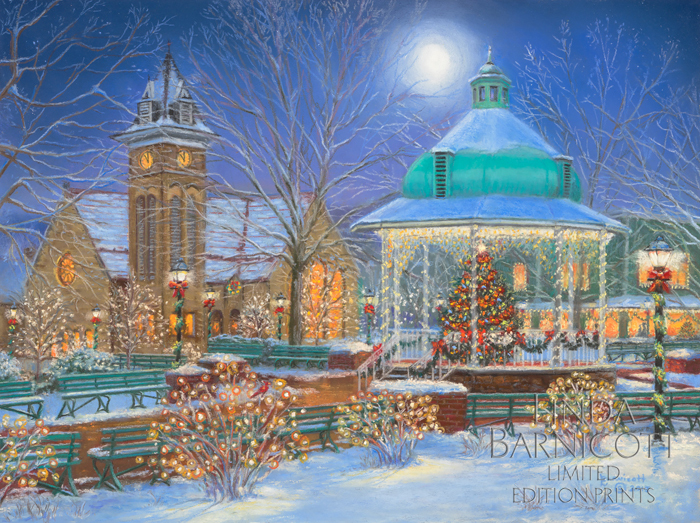 Linda’s classic painting, “Wishing Under the Horne’s Tree”, as an archival giclée print, was reproduced on the American Cancer Society’s 2010 holiday greeting cards. 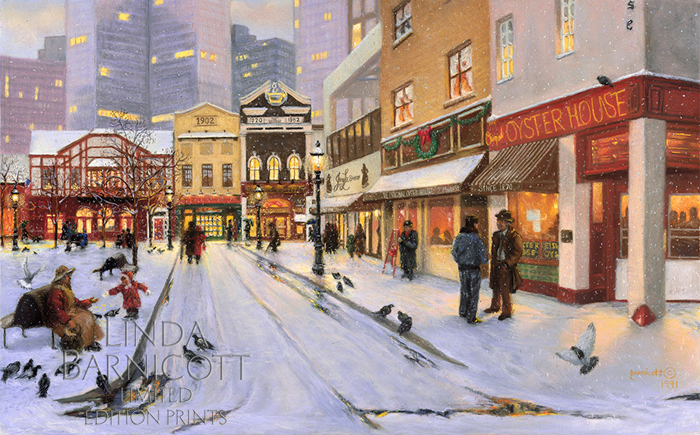 Linda’s paintings have been featured on the ACS’s holiday greeting card for the past 15 years. The sale of these cards has earned over $500,000 for cancer research and prevention. To support the Society by purchasing their holiday cards call 1-888-227-5445. 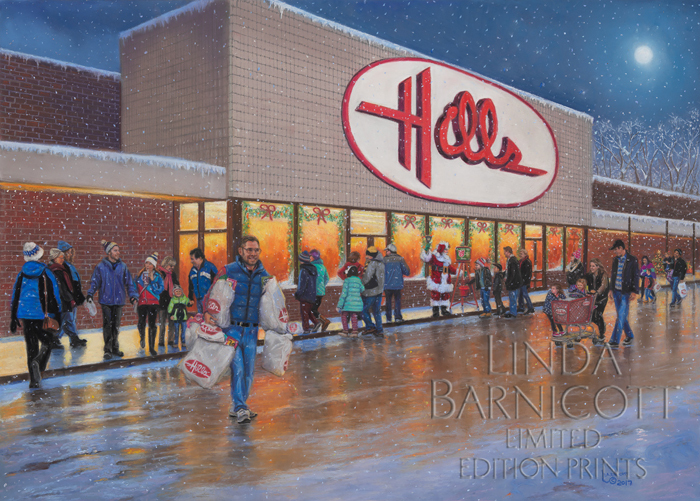 Linda’s print, “Hills Is Where the Toys Are” features “Pittsburgh Dad” as he leaves the Hills Department Store carrying large bags loaded with holiday gifts. The beloved store brought delight to all as they walked through the doors, smelled the popcorn, saw the scrumptious snack bar, and explored the wonderland of toys. 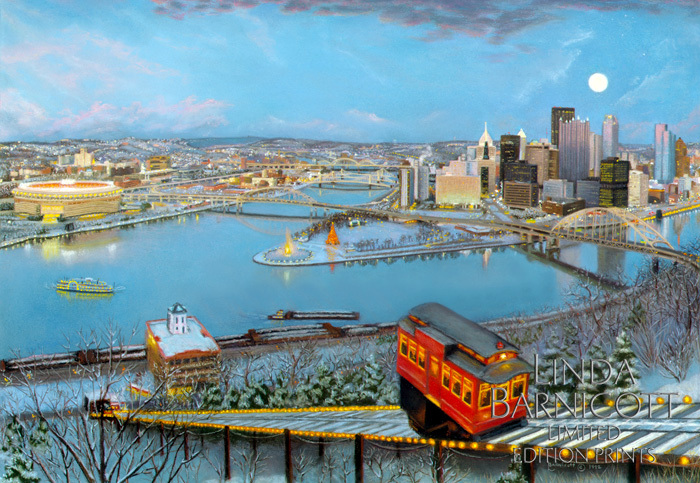 This vibrant limited edition giclée print celebrates one of North Side’s honored traditions and features a portrait of one of Pittsburgh’s most loved celebrities in, “Ice Ball Treats with Gus and Yia Yia”. 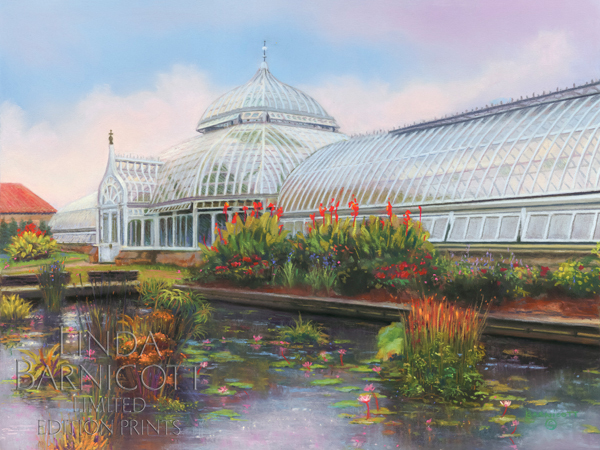 “Oasis of Beauty at Phipps” captures the old Victorian glass house of Pittsburgh’s Phipps Conservatory in the historic Oakland area of the city. Linda is excited to continue her partnership with Breathe Pennsylvania again in 2015. “Silent Night in Ligonier” is the fifth annual holiday painting that Linda has created for this valuable organization. A portion of all sales will be donated to the care and medications for families Breathe Pensylvania supports. 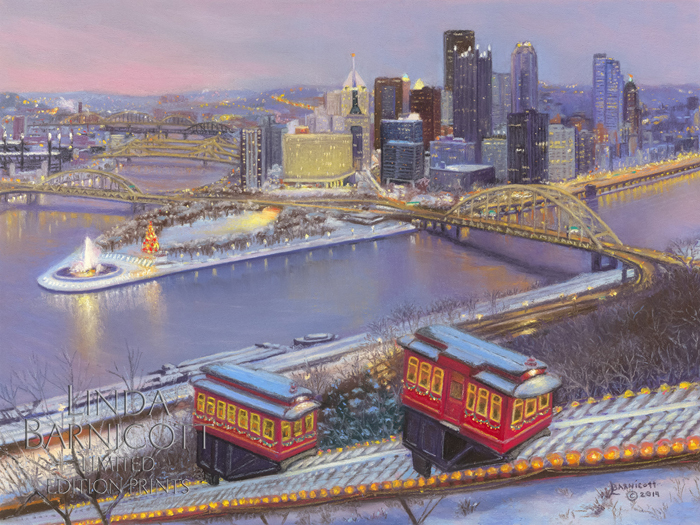 Linda invites you to step back in time and visit one of Pittsburgh’s most charming neighborhoods as “South Side Sparkles”with the splendor of the holiday season.This captivating painting was featured on the American Cancer Society’s 2006 holiday greeting cards. Now available through this web site! 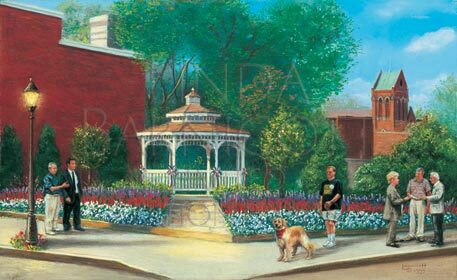 “The Heart of the Community, Pittsburgh’s West End Gazebo” captures the charm of Pittsburgh’s Historic West End neighborhood. “Winter’s Beauty at McConnells Mill” is the third annual holiday painting created for Breathe Pennsylvania (formerly known at Healthy Lungs Pennsylvania). A portion of the proceeds from sales will go directly to the care and medications for families this great organization supports.